Narrow miniature leaves are a rich dark chocolate color forming tidy rosettes that hug the ground at 2”. 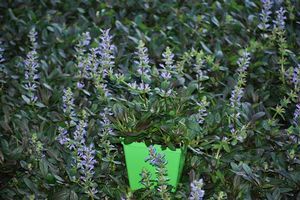 Lacy blue flowers at 3” will shine in May and June. 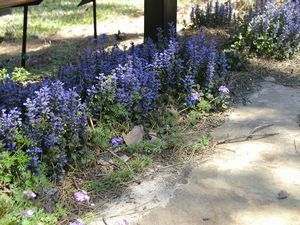 Extensive breeding makes this Ajuga a delightful true natural dwarf alternative to the traditional groundcover for sun or shade. Ajuga grows well in full sun if constant moisture is provided. It will tolerate any soil type as long as it is well-drained. Good air circulation is essential to avoid crown rot. 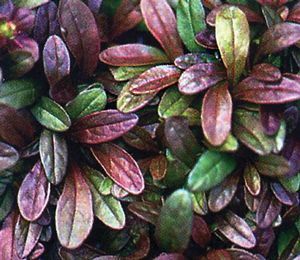 This species grows quickly and should therefore be planted in areas where a mass of groundcover is desired such as on a slope or under a tree. Do not use it as an edging for the lawn; it will easily spread into the grass. Propagate by division any time during the growing season.